… or how to make three delicious puds from one pot of stewed rhubarb. 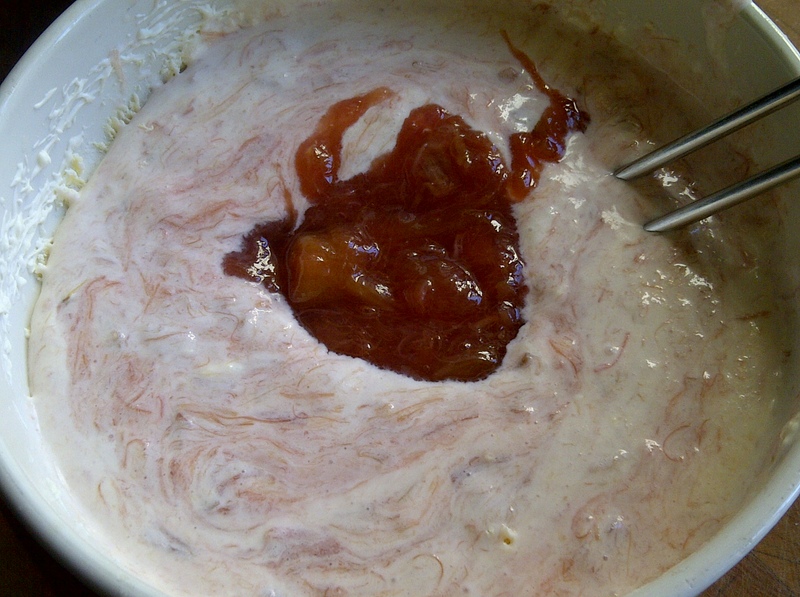 Stewed rhubarb – I don’t know about you but the words conjure up, for me, rather nasty school meals of overcooked, stringy rhubarb dolloped with gloopy custard. It doesn’t have to be like that. If you grow rhubarb in your garden, now is the time to pick it before it gets too big and coarse. Pull up the stems when they’re still pink and slender and cook them with a modicum of sugar (if you like it tart) and rather more (if you have a sweet tooth). Then you just mix it up with cream and maybe a little ginger and you have the basis for these puddings. If you have a freezer it’s worth cooking extra and making all of them in one fell swoop – then you have a couple of special desserts when you have guests or just don’t want to cook. 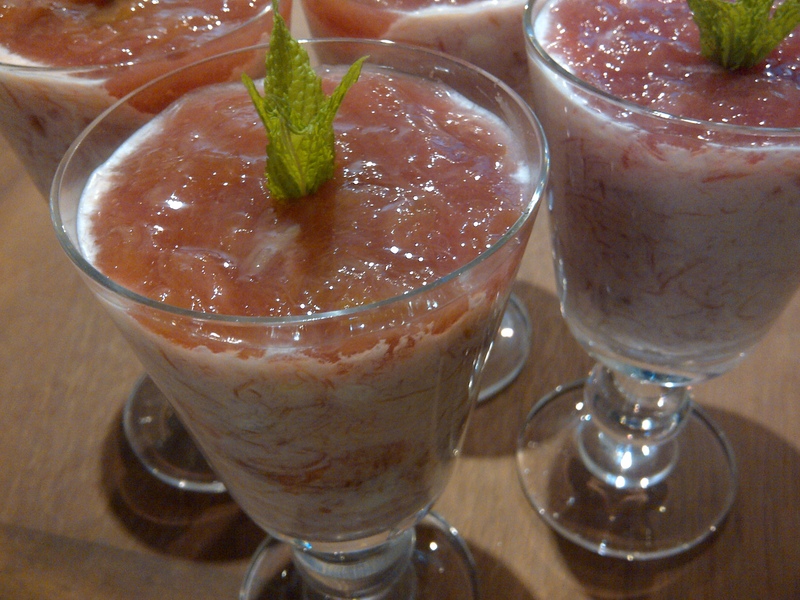 The first is a classic Rhubarb Fool. The second is a Rhubarb Parfait made by simply freezing the leftover fool (an idea I got from the brilliant Darina Allen) and the third is a Rhubarb and Ginger Ice Cream – the same base, with a few added ingredients. A pound of rhubarb will make enough fool for four to six people. Double or treble the quantities if you want to experiment with the other recipes at the same time. Rhubarb produces a lot of liquid when it is cooked and because the juice contains a lot of flavour, you don’t really want to strain it all away. If you wish, you can add gelatine or a vegetarian equivalent to stiffen the mixture, otherwise it may be too runny. 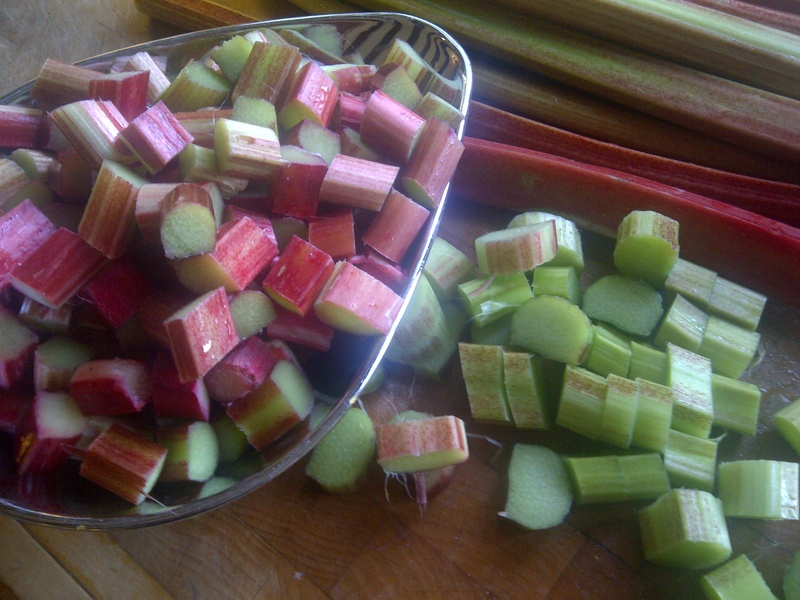 Cut the rhubarb into chunks, cutting off any leaves and rooty bits, rinse well and give it a good shake in a colander to drain most of the water off. Put it into a stainless steel saucepan with the sugar, cover, bring to the boil and simmer until soft, about 5-10 minutes. Make sure the sugar doesn’t catch. You shouldn’t need to add water because the rhubarb will produce lots of its own juice. Break up the gelatine leaves, if using, and soak them in a tablespoon or two of cold water to soften. 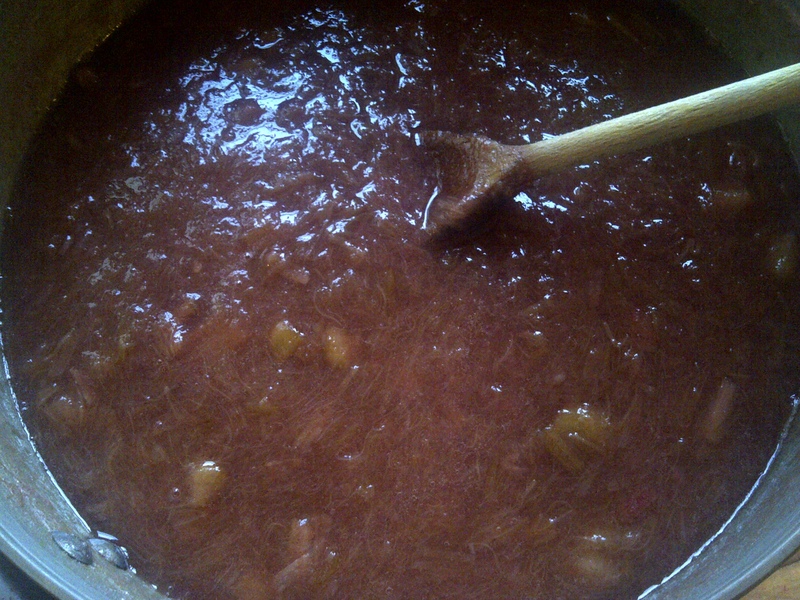 Stir the rhubarb with a wooden spoon until it turns into a sort of puree. 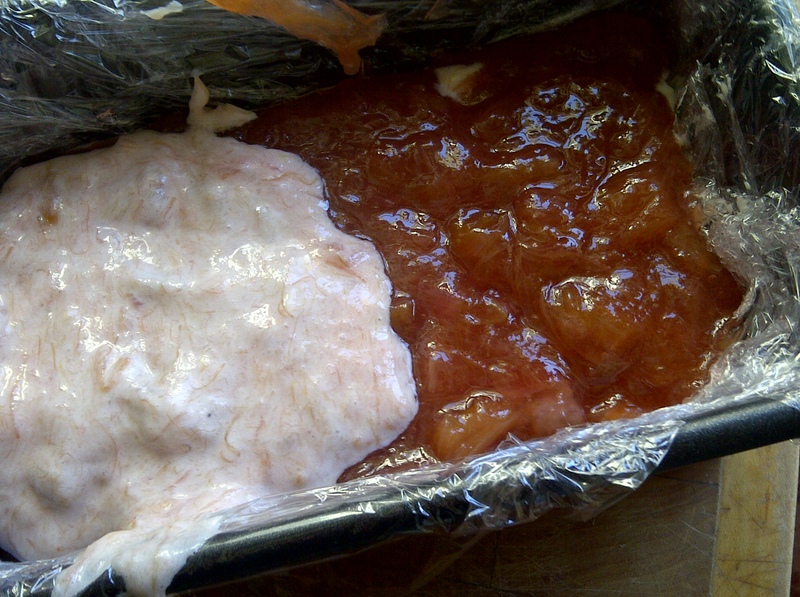 Squeeze the excess water from the gelatine, add it to the puree and stir well to mix. Allow to cool. Remove a few tablespoons of the puree and set aside. Whip the cream to soft peaks and fold it through the rest of the rhubarb mixture, trying to keep a few streaks and stripes to get a marbled effect. Spoon carefully into individual glasses and chill in the fridge. Just before serving, spoon a thin layer of the remaining rhubarb puree onto the top of each serving and top with a sprig of mint. Make a rhubarb fool, as above. Line a loaf tin with clingfilm/plastic wrap, leaving some overlapping the top edges. Carefully spoon a quantity of fool into the tin, making sure to fill it into the corners. You can layer it with rhubarb puree if you want to get fancy. 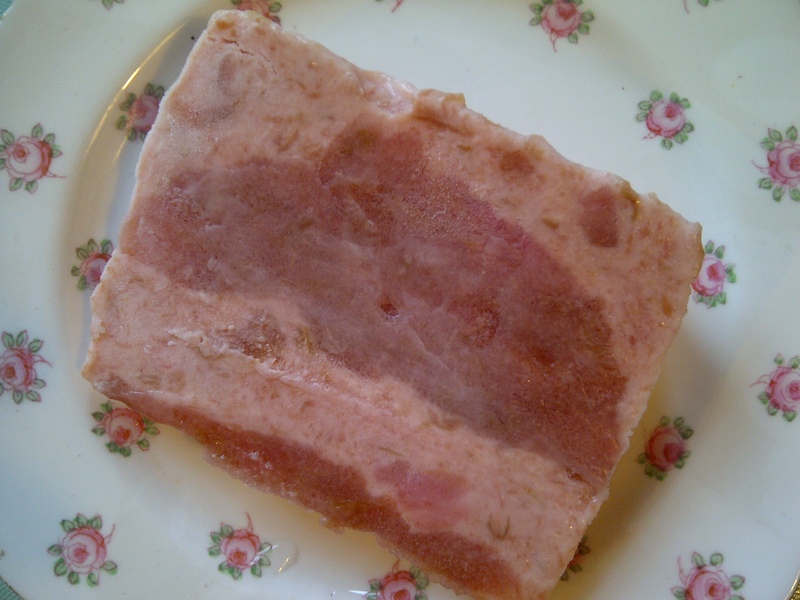 Lay a piece of greaseproof paper on the surface, put another piece of clingfilm over the top and freeze. Sometimes it turns out more crystalline than others – it depends on the water content. If frozen hard, soften in the fridge for 20-30 minutes then turn it out onto a plate, making sure you’ve got all the clingfilm off. Serve it in slices. It’s good with a compote of rhubarb: cut the rhubarb into chunks, sprinkle with sugar and roast in a single layer in an oven dish until tender to the point of a knife but still firm enough to hold its shape. 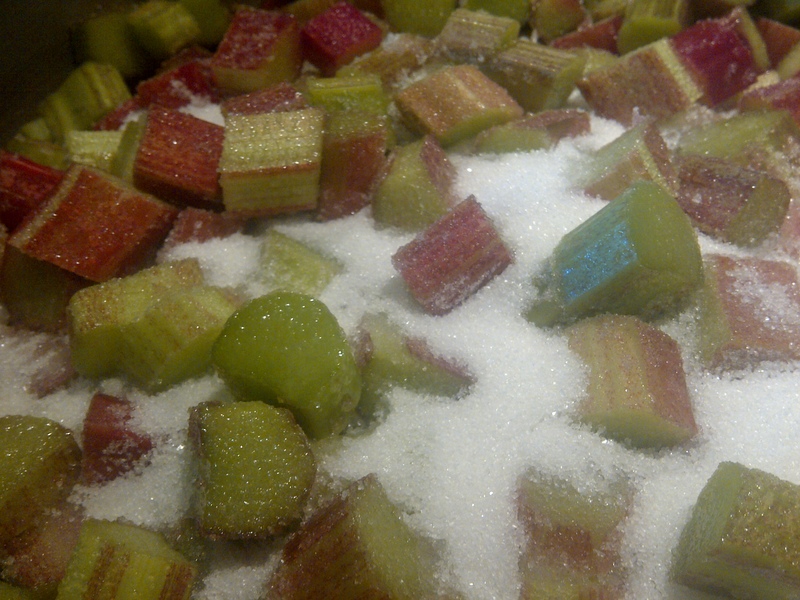 A quantity of rhubarb, as above. Increase the amount of sugar in the puree or, should you happen to have some lurking in a cupboard, stir in a hefty wallop of rhubarb and ginger jam. Fold in the whipped cream, as before, to taste (or you can try Greek yoghurt or custard). Take a handful of preserved ginger (the sort that comes in a syrup) and chop it roughly. Add it to the rhubarb mixture. Freeze in an ice cream machine or in a plastic freezer box. If frozen hard, allow to soften in the fridge for 20-30 minutes before eating. This entry was posted in Desserts, cakes and biscuits, Fruit, In the garden, Vegetarian and tagged desserts, puddings, rhubarb and ginger ice cream, rhubarb fool, rhubarb parfait, seasonal recipes by Linda Duffin. Bookmark the permalink.